As usual for a Monday (or any day really), I have a song stuck in my head from our Sunday church gathering. I’ve listened to it a few more times since. There’s a part near the end of the song that gets me thinking. 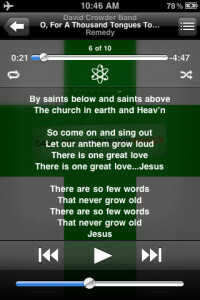 Most of the song is literally old words, with the verses written by Charles Wesley in 1739. A chorus and bridge added in recent years make it possible for these old words to not grow old. There are words that do grow old though. Death, destruction, the darkness that is sin, including my own. I get tired of hearing the same words after a while, like complaints, including my own, or certain songs that are overplayed on the radio. The words I especially don’t grow tired of are the unsolicited verbal “thank you” or the “sorry” and “love” notes from my kids. This isn’t meant to be an exhaustive list, just the first things that came to mind. I’m curious, what are some other things that don’t grow old? wow….great post…things that grow old for me? my own procrastination and laziness among other things. Things that will never grow old??? I don’t think puppy love will ever grow old. Not the mushy teenage kind….actual puppy. love. …walking along a beach with the water lapping at your toes. …being in the audience of Roger Clyne and the Peacemakers show. …enjoying a grilled-to-perfection steak and a baked potato, with a margarita followed up by great dessert…like cheesecake. 😉 with friends. Thumbs up clicked. Thanks for adding to the list! Charles Wesley, younger brother of John Wesley, who wrote 8989 hymns, or roughly >10 lines of verse every day for 50 years. Hear a bit about both in “The First Great Awakening 1720-1740” at https://dbcmedia.org/sermons/church-history-complete-mp3-series/ ; my new favorite series of MP3 “sermons” available online. 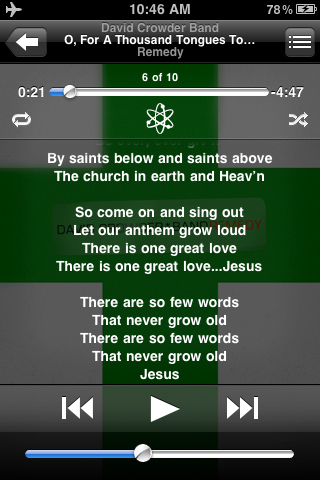 This is what the Leeland song The Great Awakening is about. I posted the video on fb after the concert. The lyrics are a poem from that time that they came across in The Patriot’s Handbook or something similar.